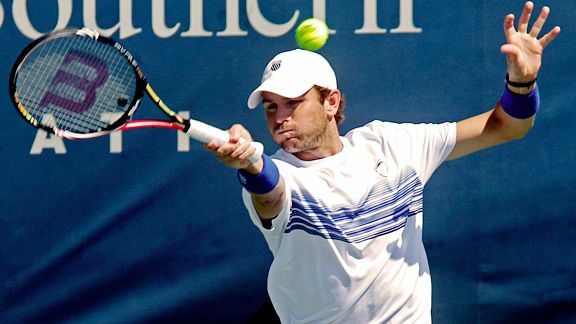 AP Photo/Al Behrman Mardy Fish has had a great summer, and his fans -- Fishheads -- are happy about that. Why do you think you have been so successful this summer? How did it feel to upset an old friend, Andy Roddick? (laughs) Well, obviously we both like to go deep into tournaments. We are really close. We got married at around the same time. We got to play a little golf in Austin before Cincinnati. I'm OK. I just hit the ball around. I'm excited to see him play at the U.S. Open at night. Andy loves to play under the lights. Sounds like you have a great support system between your friends, your cheering section and your wife. Do you ever play tennis with your wife, Stacey Gardner, a former briefcase model on "Deal or No Deal"? Oh, yes, the Fishheads! I hope they will be at the U.S. Open! The last time I played tennis with my wife, our dog got hit in the face by my brother-in-law. That was the last family outing. Oh yeah, the dog is fine. Well, not really. There is not time for much else besides tennis. Actually, I would like to join a dodgeball league! Definitely. Or a softball league. I would play a position where you don't have to catch the ball, so I think a pitcher would be a good position. A bowling league would be good, too. Some type of Fish pun -- but I can't think of anything right now. Aren't you guys creative? That's what you're good at.